Rockmount School has recently been restored and developed and is now a state-of-the-art 21st century school. The history of the school, however, reaches back to Victorian times when Crystal Palace was in its heyday. Many fine buildings were built around the school and a ‘recreation’ park created across the road from the school building, which still provides peaceful green views from classroom windows. It was in 1880 that education became compulsory for all children from the age of five to 10 years old. As a result, Croydon Council built the first school on this site in 1882. It only cost £5,684. In those days parents had to pay tuppence a week in school fees and the running costs were funded by rates, parents’ fees and a government grant. All children carried a white hankie or a clean piece of rag. Boys kept theirs in their trouser pockets and the girls, pinned to their dresses. Each classroom had a warm coke fire burning in the grate with a metal guard in front for the children’s safety. 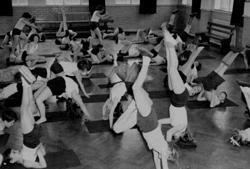 In 1900 the school leaving age was raised to 12 and subsequently in 1918 to 14. The school on Chevening Road initially had three separate sections: the Infant School, the ‘Post Infants Girls’ and the ‘Post Infants Boys’. 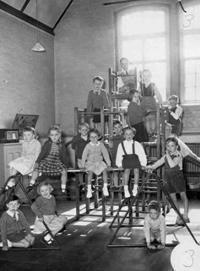 As the leaving age was raised, the schools accommodated older children until 1932 when secondary aged pupils went elsewhere for their education. In 1892, the girls and the boys schools amalgamated, but it was not until 1922 that the school took the name ‘Rockmount School’. At that time, some of the pupils lived in what was known as the ‘New Town’. This was an area specially built for the navvies who had built the Crystal Palace. It was a walled-in area with a community of brick layers, carpenters etc. Since many of their children went to the school, they wanted a gap in the wall to lead into the school grounds. After some disagreement, an entrance was finally knocked through. In the early twentieth century, the older girls would walk across the recreation ground to Ingram Road School for lessons in laundry and cookery. The boys walked, whatever the weather to Whitehorse Road School for woodwork. Back at Rockmount, the girls and boys each had their own entrances on either side of the front of the school. In 1911, in celebration of the coronation of King George V and Queen Mary, a communal sports day was held on the Recreation Ground with Rockmount, All Saints, Ingram Road and St Joseph’s school. The children sang the National Anthem, finishing with three cheers for the King and Queen. The Norwood Military Band played. On 1st May, known as Maypole Day, a post would be erected in the playground of the school and the children would dance around with long ribbons connected to the post. In 1904, Empire Day celebrated Queen Victoria’s birthday. The children would walk around the school playground, waving Union Jack flags and singing patriotic songs. 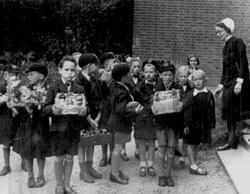 During the Second World War many of the children at Rockmount School were evacuated out of London to safer areas in the countryside. Many children were evacuated to Brighton initially. Later, more were sent to Ascot – another destination which is easy to get to by train from our area. After that, children were sent to a variety of places, perhaps to friends and relatives who lived in safer areas or joining groups being sent from other schools. Many of you will remember Rockmount’s more recent past when an infant school was built on Hermitage Road and later a nursery school. More recently still, we have had a very environmentally friendly new infant block added to the original building on Chevening Road, so that once more all Rockmount children are schooled on the one site. Instead of coke fires to heat the building, we are using a ground source heat pump. Rather than chalk on blackboards, teachers use interactive whiteboards. The times are ever changing. 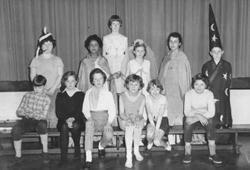 Please do send us your memories of Rockmount School along with any photographs which might make an interesting addition to this history page. Rockmount School has seen many changes over the 132 years that children have been educated here. 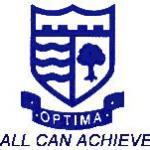 The school crest tells of some of these historic changes. The tree represents the Great North Wood, an ancient piece of woodland, which used to extend through the Recreational Ground opposite the school. These great trees were cut down to enable the park land to be used by the local residents to grow vital vegetables to keep them healthy and nourished through the war years. Some of the Great North Wood still remains within the grounds of Virgo Fidelis and the Priory School. The waves represent the River Effra, which used to run through the bottom of the playground until it was channelled into a tunnel, which became part of the Victorian sewer drainage network for Upper Norwood and beyond. The wall was built along the bottom of the school playground and up the hill towards Central Hill. Many of the children who used to come to Rockmount School, lived within the ‘Norwood New Town’, an estate built in 1840, completely surrounded by a wall, for the workers who built the Crystal Palace.